How did you prepare for the journey? We bought the car – a thirteen year old Suzuki Swift – from a garage in Blackburn just before the rally. We paid £470 for it. We were lucky; we didn’t have any major problems with it. It’s a legend that car! We did 19,800 miles in it by the end; it doesn’t owe us anything. What was the hairiest moment? Getting stuck in the no man’s land between the Turkmenistan and Uzbekistan border was probably the worst. They did a full search of the car as we left Turkmenistan and then we drove over to the Uzbekistan crossing and they didn’t want to let us enter. We couldn’t turn around because we’d already had our visa stamped on leaving Turkmenistan, so we just had to wait there, arguing, until they finally let us in. We spent a long time at border crossings over the course of the trip. We travelled through some amazing cities – St Petersburg in Russia, Tallinn in Estonia, Astana in Kazakhstan were great. Iran is a wonderful country – the people were so welcoming. Perhaps the most amazing thing was driving into Ashgabat in Turkmenistan. As we left Iran, which is very poor and has very little infrastructure, we drove through twenty miles of desert and then arrived at Ashgabat. Suddenly there were chrome street lights, gleaming silver curbs, people cleaning the streets every twenty metres, policemen on every corner, absolutely immaculate, and amazing architecture because the public buildings resemble the functions they provide – so the house of free creativity is a book, for instance – and then you drive out the other side and it was just desert again. The oil wealth was amazing. In Turkmenistan we also visited the ‘Gates of Hell’ – a burning oil crater right into the desert. We made it out there in the Suzuki by letting the air out of the tyres and driving out in convoy with one other car. The guys who lived there said we were the first two-wheel drive car to make it out to the Gates of Hell. We camped next to it that night, it was surreal; a burning crater in the middle of nowhere. How did you split the driving? We took it in turns so one of us would do one day, then the next day would be the other person’s turn. It worked out about 50/50 each. The worst place to drive was Mongolia , in a lot of places there were no roads, so you had to really concentrate on not driving into potholes, making sure you didn’t get stuck or damage your car. The night driving was bad too; we didn’t want to do any, but sometimes we couldn’t help it. We had to make up the miles so we got across the country before our visas ran out. In most places there weren’t street lights, so you could only see about three metres in front of you. What was it like to arrive at the finish line? 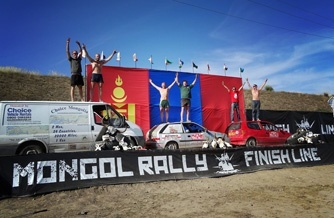 We’d been driving through rural Mongolia, passing people who live in yurts, who have some sheep and that’s all they have to live off and suddenly we got to Ulan Bator, where the rally finished, and there were roads again and nice hotels and it is quite westernised and the traffic is horrendous. Then we had to turn around and drive back; doing 600 miles a day through rural Russia! It’s funny, some of the countries we drove through before we left I was thinking ‘why are we going there’ but when we were there it was great. We’d definitely go back. Even if we didn’t drive there, we’d go back and visit them again definitely. 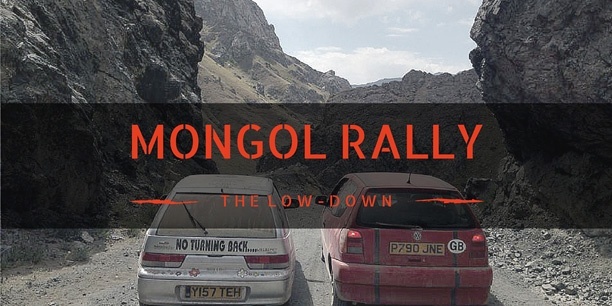 Could you survive the Mongol Rally? Try our fun quiz to see how far you would make it on the journey to Ulan Bator. 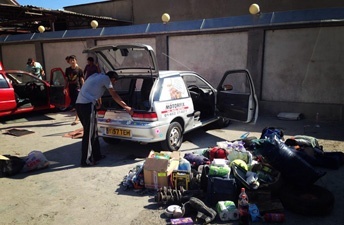 This is the second post in our three post series covering the No Turning Back team's adventure on the Mongol Rally.